Each summer KSH & Co offers a six week work experience programme for first or second year postgraduate or undergraduate conservation students, provided they can confirm they are on a recognised training course. This programme (which has proved extremely successful and from which we have had excellent feedback) runs from the first Monday in August through to mid September, although on occasions this can be flexible. The programme is planned around a variety of appropriate projects that will be in hand at the time; therefore the number of students taken each summer will vary according to the needs of these project(s). 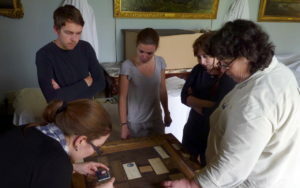 Normally the student discipline intake is predominantly in paintings conservation, however placements in objects conservation are sometimes offered – specifically for those interested in decorative polychrome. The content of the programme and number of student placements available each year is finalised every March or early April, at which point a flyer will be sent out to various recognised training courses worldwide. Student selection will be made during April and will be based upon application involving a brief letter of interest and a brief CV. Successful students will be provided with free accommodation in the beautiful 1730s grade 1 listed William Kent stable block set within the grounds of the Houghton Hall estate, home of the Marquis of Cholmondeley. The first floor apartments within the stable block are 5 minutes walk from our studios; they provide basic self catering, furnished accommodation with bathroom, cooking and washing facilities, and shared sleeping arrangements. Students will be required to bring their own towels, linen/bedding, etc. Successful students will be paid an hourly rate equivalent to the current UK national minimum wage based on a minimum of a 35 hour week (excluding lunch breaks); UK National Insurance contributions will be deducted where appropriate. Other expenses will not usually be covered, however opportunities to do overtime at the basic rate is sometimes possible provided supervision is available outside the hours of 9am to 5pm, Monday to Friday. When positions are available they will be shown in the Current Positions page.